Microsoft has corrected issues that caused data loss on systems upgraded to the company's new feature update the October 2018 Update. The company released the update on October 2, 2018 as a manual update to give interested users and administrators an option to install the update right away. Reports emerged shortly after the release that data loss occurred on some upgraded systems after the upgrade to Windows 10 version 1809. Microsoft stopped the update to investigate the issue and found the issue according to John Cable, Director of Program Management, Windows Servicing and Delivery. An updated version of the Windows 10 October 2018 Update is distributed to Insider Channels. Microsoft will monitor feedback closely and will push the update to retail update channels afterward but a release date has not been revealed yet. Microsoft discovered in its investigation that the issue impacted one one-hundredth of one percent of version 1809 installs. Only devices with Known Folder Redirects enabled were affected by the issue and there only if the feature was enabled but files remained in the default folder. 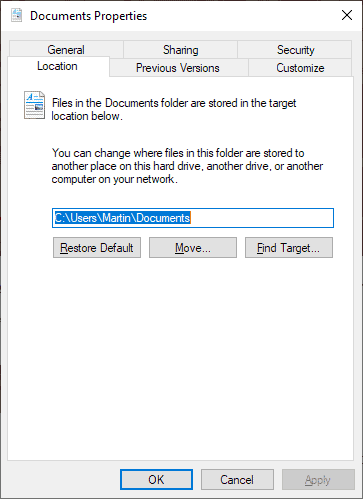 Known Folder Redirects gives users options to move the classic Windows folders Desktop, Documents, Pictures, Videos, and so on to another location. Some users and admins do that to free up storage space on the main drive. The feature is built-in to the Windows operating system. Just right-click on any "known folder", e.g. Documents, select Properties, and the Move under the Location tab to start the process. There you may also restore the default. Implementation of code to remove empty duplicate known folders automatically during upgrade. Change to the update construction sequence. The result was that the upgrade process deleted the old folder and with it the data that it still contained as it assumed that it was a duplicate of the new folder. Users who moved a Known Folder to a new drive experienced the issue if content of the old folder was not moved to the new destination. Users who moved a Known Folder to OneDrive but did not move files in the process had files deleted in the old location. Users who enabled AutoSave functionality in older versions of OneDrive as existing files were not moved to the new OneDrive location. We have fully investigated these issues and developed solutions that resolve all three of these scenarios, so the “original” old folder location and its contents remain intact. Issues that data loss occurred was reported by Insiders to the Feedback Hub months prior to the release of Windows 10 version 1809. It appears that the reports were not noticed as they did not receive a whole lot of votes or feedback. Microsoft enabled new feedback functionality today that adds options to classify impact and severity of the reported issue. Some users reported that their entire profiles were removed during the upgrade. Microsoft made no mention of that in the update on the Windows Experience website. In either case, it is best to create a full system backup of the system and important data before upgrades are installed to avoid these scenarios. I was and am worried about this because I have moved the C:\Users folder and subfolders to my D; partition via registry hacking. I have been doing this since Win2000 days and keep doing it because I am used to the structure I have created and where things are located. Microsoft – Don’t screw with my registry hack! The real question is why you use registry to change an option that is available through the UI for years now. About the lost profiles, that’s indeed really bad. I’ve read a lots of affected people confirming that they ran custom themes. But well, as the UltraUXThemePatcher homepage says in shiny red letters, “This application make changes to your system files, this can lead to unexpected problems or total breakdown of Windows!”. Well, there is an actual bug, it’s just obscure and won’t affect most people, only those that were early adopters of Microsoft’s OneDrive and Windows 10. Thanks for beta-testing Windows for us. The versions coming out now are obviously a work in progress and the risk is on the user. I won’t upgrade until the next major version of Windows which will have all the UWP, UI, and privacy issues settled, due in late 2019 or 2020. Maybe you could elaborate how that’s a big deal for people who trust in cloud storage anyway. Windows cleaning up redundant stuff seems to be a good thing to me. And that’s all it is if you tinker with sensitive system configurations: redundant system folders. Sure, they could have implemented more checks in the first place. Couldn’t, shouldn’t, wouldn’t… That’s the problem with modern systems really. They patronize us too much already. Common sense needs practice. Happy to and I never said Windows isn’t a mess. I’m not familiar with your mentioned issues but I’m a bit of a tinkerer myself. I’ve spent weeks in optimizing pretty much every aspect. It’s well documented and runs flawless. And I’m talking about rock solid flawless, with zero error/warning events and an average DPC latency of 15μs on my custom made performance mode. If the upgrade is not to my liking, I simply roll back. Takes five minutes. I rather get over with it now, because in my opinion, upgrading from rather outdated releases is even more prone to disaster. You’ve never used an ssd or a desktop computer. I’ve always moved all user folders that windows let me to another drive. I’ve always moved all contents too. This way when it comes time to reinstall windows, again, all my user folders and files are unchanged. Why anyone would move the folder but not the current contents is beyond me but, it is an available option when doing so. Yes, absolutely true making an update ferry regularly is a requirement for having a computer. Let say once a week for the ferry much-changing subject and the rest monthly. The other subject, of course, is the other new damage on the already not so good reputation of Microsoft (Where are the times that they were good). This because they have not only quite a lot of people working at the Microsoft office next to that they have multiple pre-release circles and even with that, time after time it seems not to can go right. I understand that things can go wrong thru the number of downloads but even one one-hundredth of one percent is quite a lot. Thanks, Sophie when I was posting mine comment I noticed it was not was completely correctly written English sentence! But there Is no correction possibility anymore and on moments like that, I am missing that possibility dearly. Should it be: Once a week the frequently changing (Dynamic archive) and the usually consulted archive ( Static archive) once every month. I forced the install as soon as it was immediately available and everything went great so I was puzzled by this issue. I usually redirect my Documents, Downloads, Music and Images to the D drive though and have no files on the original location since I have a 128GB SSD that I don’t want to clutter with files (only programs). And I have to say, the new screenshot tool and the dark Windows Explorer are really great. Lol wow. So this whole issue is because of some stupid file/folder setup that an extremely slim percentage of users are using on their computers. And on top of that, the users didn’t even set it up correctly in the first place? Actually, some of these people have ended up in this situation due to how the early clients for OneDrive worked. It would redirect the folders, but wouldn’t remove the originals or move the data. Fact is, deleting an empty folder isn’t usually a problem. But it’s unforgivable for Microsoft to start cleaning up folders for aesthetic purposes without checking to make sure they’re empty first. Also people did report this issue in the Feedback Hub when it was an insider build, MS ignored the feedback. As for “Disk Cleanup”, the issue is Microsoft quietly adding another folder without telling anyone. Hence people who have for years run the tool, read the folders, selected them all and go suddenly find another sneaking folder appearing in the middle of the list that they weren’t aware of. This is a BUG, as the Old Folders aren’t supposed to remain on the System. After all you changed their location, Windows isn’t supposed to have two Documents Folders, nor two Images Folders. Nice try on blaming OneDrive too, something I been using since W7 to sync my Documents (using the KFR method). When you set OneDrive to sync Documents and Images folders, and you still don’t notice your files are in the old Folders I guess the files aren’t that important after all. Microsoft better not bring that BUG back, or I’ll personally delete those Folders, this BUG has been long overdue. It’s not extremely slim % of users when you consider vast majority of users are using pre-installed Windows which very often only has C:\ drive created by Manufacturers so those users can only save in Documents other deafult folders because those vast majority of users didn’t bother to remove manufacturer pre-installed Windows and re-install Windows with D:\ E:\ etc. partitions manually created. Firstly, I am sorry, but I simply do not believe Microsoft on that “tiny” stated incidence of this problem. Not only can NOBODY disprove that, no-one! …. but also, I believe that more people than that tiny percentage are “redirecting”. I used to use that myself (not now) for example, and I accept that most won’t, but people will greater than that number, I think. They should not be removing anything!!! They should certainly not be fiddling with anything at all in the main Documents folder. Sure, if they were to “create” a new folder, say, in System32, then maybe that is perfectly right………….but Microsoft, hands off our files!!! Microsoft creation to save you spending any $$$ doing repairs or buying new software. Came across it after the 1st September Patch Tuesday went sour. Saved me from the following Updates that were supposed to fix the update from last week. Unlike “WINAERO 10” which has option’s to prevent Windows from playing update roulette, Store Auto Updates, Driver Replacement by Microsoft over what was working prior to the update, and even turn off the spying!! you can be a “seeker” & look at updates which WINDOWS UPDATE BLOCKER will let you decide which way to go. Despite being made by Microsoft they ran out of (dumped it all into version 1803 more like it!) stupidity allowing this to be so basic & simple: Check for Updates then let you know what it found & is it garbage? Be smarter than the bits & byte’s. Look it up & see if there is any nonsense yet with the update. The confirmation screen that follows is a simple check “yes, it’s trash” or “no let’s gamble on this 1” in which case it acts as commanded. Then will hide itself wherever you left it waiting for the next choice. October has been silent. After that initial September debauchery I got to remind Microsoft who owns the PC & what will be downloaded to it. “WINDOWS UPDATE BLOCKER” & “WINAERO 10” are free & simple to use. Take back your system & control with these 2 or suffer another 18 month’s until they figure out the replacement for Win 10! When you signed the EULA you gave Microsoft ALL these rights. Lmao as i predicted. Microsoft did nothing wrong. Use it as MS intended and you won’t have any problem; if you don’t want to listen, then at least don’t blame them for all problems you caused alone. Also for everyone that keeps moving folder and swap off SSD – it’s like buying a new car and then “save it” by never driving and keeping it in the garage so it won’t get dirty. Just plainly stupid. Microsoft did nothing wrong ? Redirecting in a FEATURE in Windows OS for decades and Microsoft should have honored its own features. I don’t think that ever was a more stupid programmer than the one that decided to delete folders containing data without a notice/acknowledging the user and copying them first to a backup/old folder. I am speaking from 50 years of experience in programming , projects manager, system analyst and IT security pro. I think Microsoft’s statement clearly indicates that Microsoft screwed this up. Not stupid at all. If you can’t avoid using Windows, then you have to find *some* way of making it tolerable. @ilev: Yes, junctions, symbolic links and hard links are there in NTFS since NT4 and even until now they exist just as an advanced user feature; it will be for commoners when Win includes it in GUI (something like Link Shell Extension does). No, moving system folders to other locations was never a feature; it was just possible to add your own folders to libraries or change the location, but the original folders were always inside %USERPROFILE%. Scroll up and read other comments about their registry hacks. @John Fenderson: The “i need to write as little data as possible to my SSD so it won’t break” idiocy isn’t exclusive to MS OS users. What’s even the point of purchasing a SSD if you avoid using it and move most of the stuff that would give a noticeable speed increase (swap, cache, temp, user folder, program files) to a HDD? I suppose that this bug will be corrected update and also your key of legal activation disappears, they are still arrogant deny the biggest the huge number of users with missing folders. Those who have their backup and recommended with tools outside of Microsoft can return to normal life. Nadella not an excuse or anything like to recognize we were wrong! It reinforces my decision to avoid using those folders at all. I have no sympathy for MS as debacle is completely on them. Deleting folders you think are duplicates or empty with user data without explicit user permission is arrogant stupidity. It’s pretty laughable that anyone is suggesting Microsoft did nothing wrong, the fact is even an undergraduate coder would know to check if a folder contained any files before removing it. one one-hundredth of one percent: what does this mean? It means one device in 10000 devices. I updated 40 machines last week, some of them with profiles linking to shares. No issues to report so far. This issue must’ve been isolated to those with the registry entry to delete unused old profiles after 30 days. Isn’t always COMMON SENSE to BACKUP your files before an upgrade. Folks always look for a way to blame others… But this time it’s different, if you’re looking for the guilty. You need to be looking in a mirror. Just spoke to a MS Level 3 and because I have a solid state drive deleted files are gone. Tech thought non MS disk rescue software might be able to find the files. Has anyone had any luck getting their files back?? MS taking no responsibility and only is sorry for my inconvenience of losing all my files!! Is there any hope of getting my files back?? Has anyone noticed anything being deleted other than those most specified such as MyDocuments? Has anyone lost the contents of their Desktop or any other locations under their specific UserName? Also, has anyone lost any program files or others that would impact the operation of their system? We have over 40 systems that were early implementer of Ver. 1809 and (thankfully) have not experienced any of these issues but I am wondering if this is “Good News” or simply a reprieve of sorts leaving us open to this loss at a later date? All of our system are beyond the 10 day “Go-Back” period already so for better or worse, we are stuck with it.